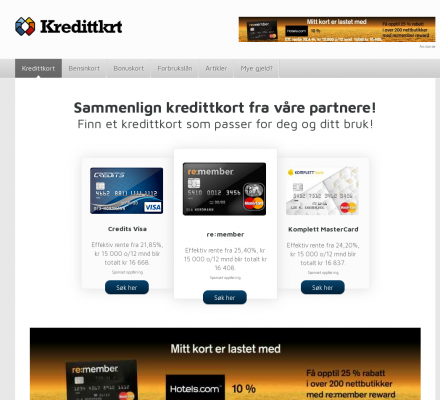 Kredittkrt.no - One of Norway's biggest comparison sites for credit cards. One of Norway's biggest comparison sites for credit cards. Users can easily choose the card that suits them and their use, and so save big on lower interest fees and discounts. Title: Compare credit cards from our partners! Description: Find a credit card that suits you and your use! LPS Business Centre (Popularity: ): Brussels, Belgium, rental of fully equipped offices and meeting rooms. Geller & Company (Popularity: ): Provides corporate finance and accounting, corporate and partnership tax, treasury, and real estate services. ProMed (Popularity: ): Offering a wide variety of financial services to doctors, regardless of their specialty. Complinet, UK (Popularity: ): The complete resource for compliance and regulatory professionals. Depository Trust and Clearing Corp. (Popularity: ): Oversees the Depository Trust Company and the National Securities Clearing Corporation. Financial Marketing Services (Popularity: ): Provides annual report solutions for financial institutions. Loan Service Center (Popularity: ): Offers loan servicing and collections for financial institutions and other organizations. Johnson Financial Services (Popularity: ): Provides a wide array of financial products and services. The Winterbotham Group (Popularity: ): Provides financial, fiduciary, administrative and accounting services. Fast Enterprises LLC (Popularity: ): Provides consulting services and software products to revenue agencies worldwide. Unsecured Business Loans (Popularity: ): Apply for unsecured - personal loan, business loan to people with any credit history.